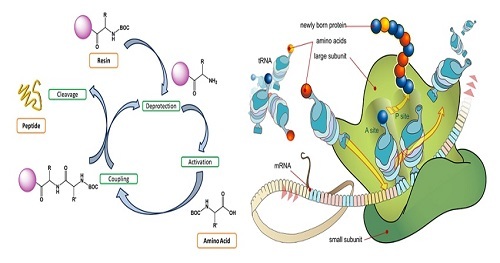 Peptide Synthesis: the production of peptides, which are organic compounds in which multiple amino acids are linked via amide bonds, also known as peptide bonds. The biological process of producing long peptides (proteins) is known as protein biosynthesis. Peptides are synthesized by coupling the carboxyl group of one amino acid to the amino group of another amino acid molecule. Peptides are used to prepare epitope-specific antibodies, map antibody epitopes and enzyme binding sites and to design novel enzymes, drugs and vaccines.